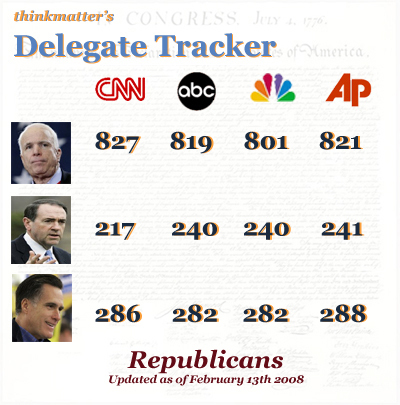 Much has happened since the last update to the Delegate Trackers. Obama has swept the Chesapeake Primary and made himself the front-runner in one night. 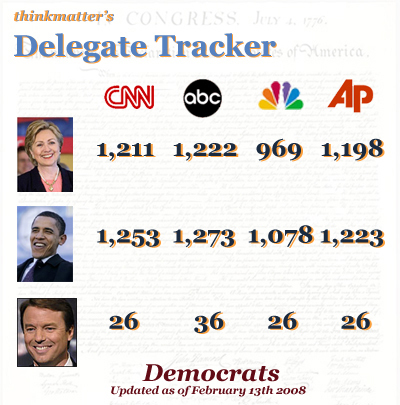 Counting superdelegates, he has placed himself in the lead according to CNN, ABC, NBC and the Associated Press (all of which are cited below). This is great news for Obama. He is showing that his message is getting to voters in such a way that a healthy plurality of them are turning out at the polls. On a winning streak, the Obama victories in every state has made the all-important political momentum shift in his favor. He is also winning in the money primary, though Hillary is quick to meet nearly all of his benchmarks (with her own money or with larger and larger fundraising efforts). Basking in his victories and the incredibly positive press he is getting, Senator Obama can expect the rest of February to look similar for him. Though I would caution that Hillary’s campaign is still the coiled cobra – ready to strike fiercely at her opponent in the next round of March and April primaries, where the demographics of states like Ohio, Texas, Mississippi and Pennsylvania appear more in line with her Democratic traditionalism. On the Republican side, McCain had a narrow victory in Virginia and Mike Huckabee is quickly looking like the spoiler of this GOP nominating process, rather than the serious candidate he is hoping to be taken as. Huckabee’s tactics look to be a play for the Vice Presidency, but on a more practical note, he is an ordained Baptist pastor and one very much answerable to the evangelical wing that lifted him to victory in Iowa and the southern states. Staying in makes him the evangelical favorite and boosts the GOP recognition of that demographic as an important group to please if there is any hope of another Republican revival.